NEW Beauty Social Network- Beautypical + Huda Beauty Giveaway! 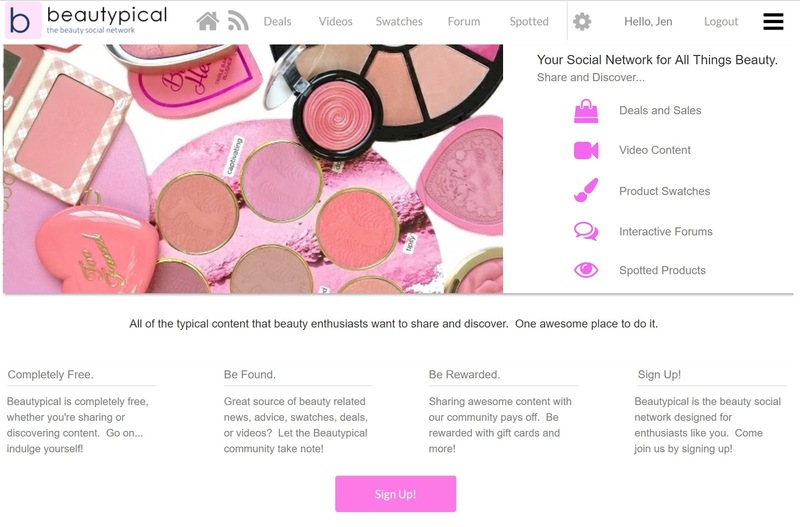 I'm so proud to announce a new way to share our love of beauty products...Beautypical.com! I was heavily involved in the development of this site and have been beta testing it for a few weeks and I'm really excited about all of the features. 1. Submit your favorite YouTube videos...the ones you've found to be most helpful. YouTube is such a huge place that many smaller YouTubers that are producing great content are getting buried in the search results and not shown due to the new algorithm. You can rate the videos that are submitted to the Beautypical site and the best, most highly rated videos will rise to the top. 2. Submit and view Beauty Deals... all the freshest coupon codes and beauty deals. No more wading through coupon sites for the beauty stuff, or following multiple accounts on Instagram. This is all in one place. 3. Swatches...A huge gallery of makeup swatches that's searchable by brand or product name. Rate the ones you like the best to let the most helpful, most true-to-life swatches rise to the top of the results. 4. Spotted...This category was one of my additions to the site and is kind of an ode to Nouveau Cheap (I really miss her site and all the deals and product sightings!). Here, you can submit new product sightings, both online and in-store. Also, the in-store sighting has a map option so you can specify exactly which location you found the product in, so that people who live locally to you know which store to visit (whether it's CVS, Rite Aid, Sephora, etc.). 5. Forum...this is the place to talk with other members of the site and discuss new products launches, share beauty tips, ask beauty-related questions, share your looks, and more. Users can also gain "Beautypical Credit" every time they share something on the site, and also when their content gets rated positively. Every week there are challenges that you can meet and the person with the most credit will win something (Ulta/Sephora gift cards, high-end palettes, etc). I'm so excited to share the site with you and I hope that you'll sign up and play with everything! This week, they're giving away a Huda Beauty Desert Dusk palette (worth $65 to one person at random who signs up for the site and submits at least one deal, swatch, or video). This is amazing, congratulations!! I just signed up for the site and am so happy to find lots of deals I'm interested in already. I've been missing G from Nouveau Cheap a lot the past few months but seeing all the deals and new makeup in one site makes me happy. Also, when I saw the sightings map I also thought of her. Great idea and addition to the site! Sign me up! I just visited the site and there are so many deals to be had, I'm going to go broke. I also miss G's deals but this is even better and more organized and easy to search. Thank you for sharing! I already noticed a couple bugs. One with the rating system. I can't give a 5 star rating. The other was a random bug when I tried to create a deal. It auto assigned it as Amazon the first time around. Otherwise, looking good so far!